Hundreds of fishmongers on forklifts and trucks rose before dawn in Tokyo on Oct. 7 to join a mammoth exodus of vendors as the world-famous Tsukiji market relocated to a new site. In small vehicles and the market’s famed “turret trucks” — one-man flatbeds with a barrel-shaped steering column at the front — they drove out of the Tsukiji site one last time, headed for Toyosu, the market’s new home. The main bridge out from the market was closed to traffic for the move, with security guards in place to wave along the leaving wholesalers, who drove in orderly lines between safety cones topped with flashing red and green lights. Hundreds of the 900 businesses that once handled 480 kinds of seafood worth ¥1.6 billion every day — as well as 270 types of fruits and vegetables — were relocating. 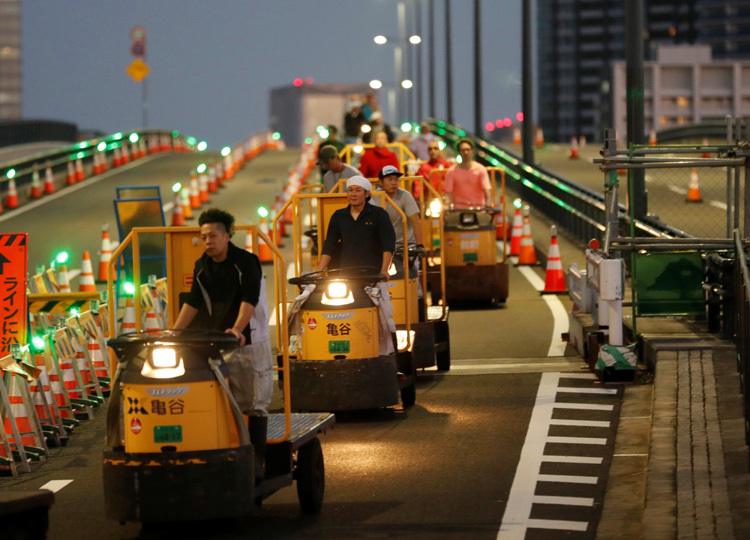 A total of 2,600 turret trucks and forklifts were set to drive about 2.3 kilometers from Tsukiji to the new site over a period of five days, according to the Tokyo Metropolitan Government.